Sometimes a good idea comes at a bad time. William Ogden felt he had the right idea in the right place. However, timing was not on his side. Ogden was a man who enjoyed life and generally did so with a drink in hand. When he opened his tavern on Miami’s most important street, he felt he was serving the downtown crowd and tourists with good food, good drink and great times. William Ogden was a man of means along with a good sense of humor. When he finally opened his business on Twelfth Street, later renamed to Flagler Street, he made sure the name of his tavern was as memorable as it was entertaining. He called it the Ye Wee Tappie Tavern. William B Ogden came from a very prominent family in Chicago. William’s father was Mahlon D. Ogden. Mahlon was a very prominent member of the Chicago business community. Mahlon may be best known for his home. 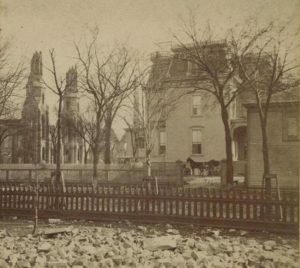 The Ogden mansion was one of the few buildings that survived the Great Chicago Fire of 1871. While the Chicago Fire destroyed many of the buildings in the downtown area, the Ogden family had enough foresight to cover their wood framed mansion with water soaked carpets to avoid the fate of the buildings around them. When sparks spread the fire from building to building, the soaked carpets kept the Ogden home from catching on fire. The Ogden home was one of few buildings that survived the very destructive fire. It was located on the north side of Walton Street, between Dearborn and Clark. It is now the site of the Newberry Library. While William Ogden’s father was best remembered for his home, it was his namesake that historians recall the Ogden name with admiration. 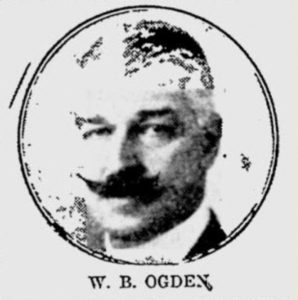 Uncle William Ogden was one of Chicago’s most prominent early pioneers. Uncle William helped incorporate the city and was named the first Mayor of Chicago in 1837. He was a big reason why Chicago became one of the most important cities in the second half of the nineteenth century. By the time that the younger William Ogden had grown, his family was very well known and also very wealthy. William Ogden had several children, including a son, also named William. His journey began in Chicago and eventually brought him to South Florida. 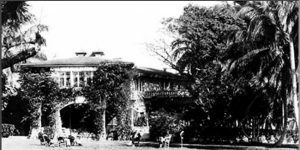 In the early 1900s, William Ogden purchased the Tee House Plantation in Lemon City. The Lemon City home was built in the late 1800s by D.C. Brown. Brown was a widower at the time he built Tee House and lived there with his son and daughter-in-law until they sold the property to Ogden. William Ogden had become quite an eccentric by the time he moved to Lemon City. While he lived in Lemon City, it was said that the Tee House Plantation possessed a large rare book collection, an original Rembrandt, tapestries and oriental rugs. One visitor noted that there was a bar in every room of the house. William Ogden was known for entertaining at his home. His parties were quite raucous and Ogden had quite reputation in town. It was only natural that he open an establishment that moved the party to downtown Miami. Figure 3: Twelfth Street in 1908. Commercial Hotel & Schmids Restaurant on right. By 1911, the proprietor of the Commercial Hotel and CW Schmids Restaurant was ready to sell his business. Both businesses had been operating at 408-410 Twelfth Street since the early 1900s. The land and buildings were owned by Miami Sheriff Dan Hardie. William Ogden, armed with plenty of family money, was interested in taking over the businesses. Initially, Ogden leased the buildings while operating the hotel and tavern. He later purchased the land buildings from Hardie for roughly $25,000. Ogden kept the hotel opened, but changed the restaurant. He re-decorated and retrofit the interior to be a classic tavern. He created a beer garden on the west side of the building. Finally, he changed the name of the restaurant from Schmids to Ye Wee Tappie Tavern. Despite Ogden’s reputation as the life of the party, he made sure that his establishment had a touch of sophistication. The interior of his tavern was elegantly decorated and his waiters wore tuxedos. The tables were covered with white tablecloths and white folded napkins. Food was served on fine china and nice silverware. A patron could enjoy a fine meal along with the beverage of their choice. On rainy night in late October of 1913, Dade County voted itself dry. The implementation of the new law took place in early 1914. Prohibition began in Miami a full six years before it began for the rest of the country. Despite the law, William Ogden continued to operate his tavern. However, it didn’t take long for Ogden to realize that prohibition in Dade County was not going to be over turned. By 1915, the beer garden began to sell vegetables instead of beer. By January of 1916, Ogden knew that he couldn’t keep operating a tavern in a dry town. On January 19, 1916, Ogden sold the hotel, restaurant and property to W.H. Nichols for $50,000. Ogden sold the property for double what he paid for it a few years earlier. Nichols renamed the hotel to the Majestic Hotel. The restaurant continued to operate as Ye Wee Tappie Tavern. Here lies ‘les restes’ of Ye Wee Tappie Tavern. Once a hotel, gaudy, gilded cavern. Born in champagne in Nineteen and Eleven. Died in limeade before she was seven. Nichols agreed to the unusual deed stipulation and placed a bronze plaque in front of the Majestic Hotel. It remained there until 1921. Following the sale of the tavern, William Ogden spent time in both Lemon City and downtown Miami. On October 12, 1921, Ogden died at his apartment in the Security Hotel at 112 NE First Avenue in Miami. 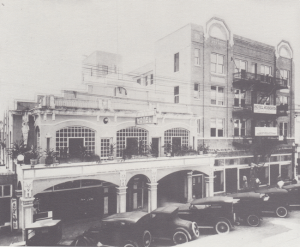 At the time of his death, he owned the Paramount Hotel and Theater on NE First Avenue in downtown Miami. The Miami News reported that William, despite being considered in very good health, died of acute indigestion. He died at the age of fifty five. The article noted that Ogden had sold the Tee House Plantation to Ed Ballard a year earlier. However, another Miami News article later stated that Ballard purchased the former Ogden home as part of probate process after Ogden’s death. The timing of the close date may explain the discrepancy. Ballard later turned the home into a gambling den. Ballard later sold the Tee House Plantation and moved his gambling operation to Palm Island where he ran the Palm Island Club. The Tee House Plantation became an American Legion Post. It still stands today as the recreation center at Miami’s Legion Park. 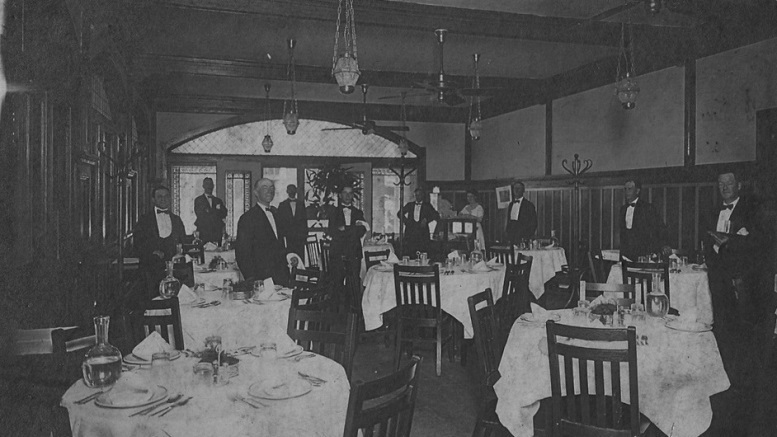 Just five years after Nichols purchased Ogden’s hotel and restaurant, he sold his interest to the proprietors of the Hotel Roberts in 1921. The new hoteliers built a much larger building to the west of the Majestic Hotel. Following the completion of the new wing, they merged the Majestic Hotel into Hotel Roberts. It was during the merger of the two buildings that the plaque was moved to the new wing of the complex. The plaque that was required to remain at the outside of the former location of Ye Wee Tappie Tavern was placed in the wrong location. The misplacement of the plaque in 1921 has caused confusion regarding the proper location of the plaque for many years. 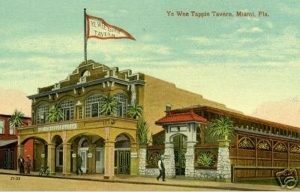 At some point during the mid-1950s, the former location of the Ye Wee Tappie Tavern and Majestic Hotel burned down. Ranch Construction was hired to put up replacement buildings. In 1957, the newly built buildings became the home of retail establishments. The Riviera Men’s Store and Sybils Women’s Apparel were two stores that operated in these buildings for many years. Both stores remained in business at this location until 1984. Burger King moved into the former location of Sybils Women’s Apparel around 1985. Given the efforts of David Weston, a self-described urban anthropologist, a former Metro-Dade Commissioner Jim Redford, and Miami News Columnist Howard Kleinberg, the plaque required by Ogden’s deed provision was placed in the right location in front of the Burger King. Jim Redford was one of the owners of the Burger King franchise. Redford was unfamiliar with the deed covenant until he was contacted by Howard Kleinberg. Kleinberg reached out to Redford when Weston reminded Kleinberg of an article he wrote regarding the unusual deed requirement. As the owner of the Burger King franchise, Redford agreed to create the plaque and place it in front of his business. He was planning on featuring old photos of downtown in the restaurant and felt that the plaque would be a nice complement to his nostalgia theme featuring old Miami. Prior to a new plaque being placed in front of Burger King, the last known location of the original plaque was in front of Hotel Roberts. The hotel was razed in 1966 and replaced with the Roberts Office Building. The whereabouts of the original bronze plaque, as well as the replacement in 1985, is unknown. While both the retail structure built in 1957 and the Roberts Office Complex still stand today, neither buildings adhere to the deed covenant stipulated by William Ogden in 1916. 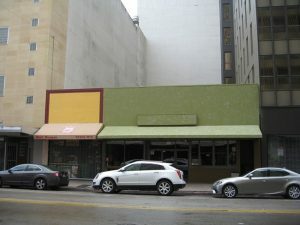 The one story retail building, built by Ranch Construction in 1957, has seen tenants ranging from clothing store to restaurants. The occupant on the eastern most building is Salt & Sugar Cafe. This restaurant is relatively new at the former location of the Ye Wee Tappie Tavern. According to the deed covenant, Salt & Sugar Café is required to display Ogden’s plaque. I am sure that the proprietor of the restaurant is unaware of the deed requirement. However, it would be nice to see the plaque reappear in its proper place to respect not only the wishes of William Ogden, but to provide historic context for downtown Miami’s most important street. Cover: Inside of Ye Wee Tappie Tavern in 1913. Figure 1: Mahlon Ogden home in 1871 in Chicago. 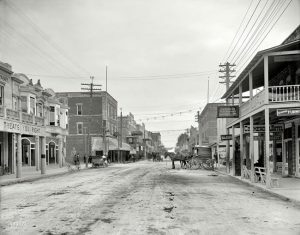 Figure 3: Twelfth Street in 1908. Commercial Hotel & Schmids Restaurant on right. Courtesy of HistoryMiami. 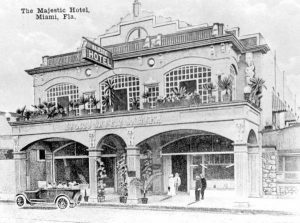 Figure 4: Majestic Hotel in 1918. Courtesy of Florida Memory. Figure 5: Picture of William Ogden. Courtesy of Miami News. Figure 6: Majestic Hotel and Hotel Roberts in 1921. Courtesy of HistoryMiami. Figure 7: Postcard of Ye Wee Tappie Tavern. Courtesy of Florida Memory. 6 Comments on "Ye Wee Tappie Tavern & William Ogden"
Great story, good to see they are still standing today.